Johnston County’s newest middle school will be opening for the first time in August 2017. This week, Johnston County Schools released a timeline for the development of attendance boundaries for the new school being built on Norris Road. The school could affect attendance boundaries for Cleveland Middle, Clayton Middle, Smithfield Middle, Polenta Elementary, Cleveland Elementary, West Smithfield Elementary, and Wilson’s Mills Elementary Schools. Chief Operations Officer Patrick Jacobs announced Tuesday that McGee’s Crossroads area schools were removed from the list so the new Cleveland middle school would not open for the 2017-18 school year at 100 percent capacity. 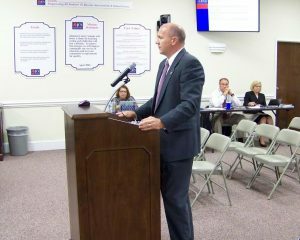 Jacobs said by October 2016, officials said they will provide several options for school leaders and the school board to consider. By November 2016, options will be discussed for public hearings and open forums with the parents and community. Cleveland Middle and Polenta Elementary are the sites being considered for those forums. Under the timeline released this week, in December 2016 the school board will be asked to approve the new attendance boundaries. In January 2017, maps of the new boundaries will be printed and posted at the affected school sites. Funding for the Cleveland area middle school was approved during the November 2013 bond referendum.